Tashkent (Uzbek: Toshkent or Тошкент; Russian: Ташкент) is the capital, and largest city of Uzbekistan. Although Uzbek is now the official language, Russian is the native language for most Tashkent dwellers, although most also speak Uzbek. Most businesses use Russian in their signs, menus, and other printed material. Only government institutions use Uzbek as the first language, and even then, many government forms and reports are in Russian, rather than Uzbek. Uzbek now uses the Latin alphabet rather than the Cyrillic that was used during the Soviet Union. This is a source of some confusion for many Uzbeks, especially those of the older generation. Shortly after the fall of the Soviet Union and Uzbekistan declared independence in 1991, the written Uzbek language was converted back into Latin characters. Many older Uzbeks have difficulty reading the Latin characters. Uzbek is a Turkic-based language, and while Uzbeks and Turks cannot completely communicate directly, the better educated on both sides can usually find some common understanding. 41.262469.26641 Tashkent International Airport (Yuzhniy (TAS IATA), Uzbek: Toshkent Xalqaro Aeroporti), Sergeli District (Located: just a few kilometres south from the city centre. ), ☎ +998 71 1402801, +998 71 1402802, +998 71 1402803, +998 71 1402804, e-mail: info@uzairways.com. The airport has two terminals, domestic (Terminal 3) and international (Terminal 2) on opposite sides of the airfield. The only way to get from one to the other is by road, a 10-minute taxi ride. You pass though passport control and pick up your luggage before going through Customs. The queues for Customs are extremely long and people frequently try to push in. Before passing through customs, you will need to fill out 2 copies of the customs declaration. These forms are often handed out on the flight or can be found on the stands in the baggage claim area. The customs officers will keep one copy and stamp the other. You will need this form when you leave the country and may have problem in taking out money without it. Make sure to declare all money and valuables (cameras, PCs, etc.). You may not be able to leave with more money or valuable items than you arrive with. The Uzbek government have strict rules on entering or leaving with money. Don't be intimidated when you see a crowd running to a passport control officer. They are just trying to get a better spot in a huge waiting line. A short and inexpensive (USD2–3) taxi journey is the easiest way to get to the city centre. Upon exiting the international terminal, a large number of men will be crowded at the (sole) exit door offering "taxi" services. For the most part, these are not "official" taxis. "Taxi" drivers will attempt to charge whatever they believe the market will bear. For those without Russian or Uzbek language skills, it is best to arrange to have someone meet you at the airport. Fair fares are usually only obtainable by those who understand the system and speak at least some Russian or Uzbek. It is better to walk 50 m from the exit towards the taxi stand where many taxis are waiting on the road and negotiate. Generally prevailing fare is minimum USD2-3 for 5 km (20 cents per each additional km). Always negotiate. Taxi drivers will rarely accept small bills (dollars, euros, or pounds), and cannot be counted upon to give change (in any currency). The 41.290969.28742 Tashkent Railway Station (Severny Vokzal), Kichik Xalqa Yo'li (Metro station "Toshkent"). The central hub for trains in Uzbekistan with most domestic trains ending or starting here. The most attractive connections are to Samarkand with the super fast Afrosiob train and the Sharq which continues to Bukhara. For Khiva and Termez there are night trains with comfortable sleeping berths. Make sure that you buy ticket a few days in advance or arrive at least 1 hour before train departure, as the queue for ticket office is often long and chaotic with people jumping the queue. For domestic departure times see the Uzbekistan#Get around section. Tashkent is a key stopping point for rail services from Central Asia. It is possible to travel from or to Dushanbe in Tajikistan, Bishkek in Kyrgyzstan, Almaty in Kazakhstan, and Moscow. It is possible to travel to China through Almaty and to Iran. Ticket prices are cheap by Western standards, but will need to be paid for in cash, preferably in USD. There are many warnings about thefts of personal belongings on the trains. Until late 2018, international buses to and from Uzbekistan were unpredictable and unreliable. 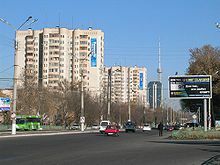 However, the easing of travel restrictions in 2019 appears to have brought with it more tourist-friendly updates to the bus network and it is now possible to take buses directly from Uzbek cities to cities in neighbouring countries, (rather than having to switch buses at border control) on certain routes, such as Tashkent-Shymkent. Others are still only served by shared taxis and marshrutkas; these tend to be slower as the vehicles aren't licenced and consequently border checks take longer. 41.2576869.193073 Tashkent Bus Station (Avtovokzal), Bunyodkor shoh kochasi and Gavhar kochasi corner (Metro station "Sobir Raximov"). Buses usually are very full and advance purchase of tickets is recommended. Tickets are sold to foreigners at Movarunahr Kochasi 51, daily from 08:00-17:00. Buses leave from here to Bokhara (11 hr, USD8), Samarkand (6 hr, USD5), and Urgench/Khiva (20 hr, USD12) (2009). 41.257169.192464 Stand for Shared taxis to Samarkand and south (big highway junction close to Metro station Olmazar (Алмазар), right next to Tashkent Bus Station). Lines to: Samarkand (3 hr, USD8), Bokhara (7 hr, USD13), Termez (10 hr, USD15), Urgench or Khiva (14 hr, USD25). 41.238969.33175 Stand for Taxis to Fergana Valley (Kuyluk Bazar). Taxis to Fergana Valley leave from here and from the Northern Station. To Andijan (5 hr, USD8) also for Osh, Ferghana (4hr, USD8), Kokand (3 hr, USD6). From Kyrgyzstan, the Dostlik post 30km from Andijan is open from 09:00-18:00. From Tajikistan Oiybek Post, 80 km from Tashkent, is open for foreigners from 09:00-18:00. Tursanzade Post, 60 km from Dushanbe Tajikistan, is open for foreigners and locals 180 km from Termez. Chorzhu Post on the border of Turkmenistan, 30 km from Bukhara, is also open to foreigners and locals. Distances from Tashkent by road: Almaty in Kazakhstan 810 km, Ashgabat in Turkmenistan 1,290 km, Bishkek in Kyrgyzstan 570 km, Kashgar in China 880 km, Andijan 392 km, Bokhara 600 km, Ferghana 325 km, Karshi 430 km, Khiva 1,045 km, Kokand 236 km, Nukus 1,115 km, Samarkand 295 km, Termez 705 km, Urgench 1,020 km. Since June 2018 the metro is not considered as military installations and therefore it is now permitted to take photographs in the metro station. In all cases do have documents while you are taking the metro (or anywhere in the city), for you can be checked any time by the police. Trains leave every 2 minutes. There are also modern buses (green). The tram service has been cancelled since 2016. Tickets (which on the metro are small blue coin size tokens) cost 1200 som for any single journey, or 1300 som if you do not have the correct change. Marshrutkas also operate around the city but are more expensive, around 2500-3000 som is a normal fare. Official taxis should be ordered in advance at the hotel reception, they are metered and issue receipts from a mashine. As of March 2018, the rate was 6,000 som per km. While there are official, authorized taxis (with the appropriate sign on the roof of the car), in reality almost any driver in Tashkent can double as a taxi driver. The local custom is to simply stand by the side of the road with your arm extended downward and slightly away from the body. A driver will pull over and then you will state your destination and ask the fare in advance. There is a common agreement on the prices, so real negotiation will be rarely be necessary or successful, only at night some drivers ask twice the usual fare. Getting from the center to the airport should be around 15,000 som, a city trip of 3 km or more around 8,000 som (March 2018). At least some Russian or Uzbek language skills are needed to accomplish this without difficulty. It is usually safe to use this procedure, although virtually every foreign embassy recommends against it. Directions are rarely given here using an address. Most often, a landmark is used, such as "near Hotel Russia". Moreover, many streets and hotels have been renamed in the past few years and often drivers will not recognize the current name of the street or hotel, still knowing them by their old names. Asking to be taken to the Grand Mir Hotel, for instance, will often result in a blank look. Tell the driver you want to go to the Gastinitsa Rossiya (Hotel Russia), however, and they will know exactly where you want to go. For those who speak neither Russian nor Uzbek, it is helpful to have someone draw a rudimentary map or write out directions in Russian. Few drivers will know English and most have troubles reading the maps on smartphones. Downloading the offline Google map of the city in advance is a good idea. You can show it to the driver and guide him provided you know a few Russian words: nalieva - left, priama - straight, naprava - right. Looking for landmarks, addresses or hotels on Google maps is uneasy because of the multiple languages and spelling. Search in advance and bookmark your destinations. Only one of the major international car hire companies operates in Tashkent. It is Naniko (local website here). If you come from Western Europe, where cities can be visited walking and metro stations are everywhere, be warned that Tashkent proportions are truly monumental. Many streets have ten lanes and buildings are huge, with plenty of space around. Plan your visit ahead and check the distances. 41.306869.24021 Abdulkasim Madrassa (Madrasah of Abdulkasim Sheikh, Медресе Абдулкасыма), Bunyodkor shoh ko'chasi (South part of the old city. A.Navoi National Park. Metro station Milliy Bog, then 500 m northeast). This madrassa was erected in honour of the great thinker Abdulkhasim Khan at the beginning of the 19th century. 41.323969.20332 Mausoleum of Zainuddin-bobo Sheikh (Мавзолей Шейха Зайнутдина-Бобо), Mannon Uyg'ur ko'chasi, Kurgancha 7th Street (Former Orifon village beyond the Kukcha Gate (now within Tashkent). From Metro station Bunyodkor, northwest about 2 km). This is the mausoleum of the son of the founder of a famous Sufi order. His father sent him to disseminate the ideas of this order. The mausoleum is of the khanaka type. The hall is covered with a double dome. Nearby is a chillyakhona (subterranean monastic cell) dating to the 12th-13th centuries. 41.337569.24013 Khazret Imam Ensemble (Ансамбль Хазрат Имам), Qorasaroy ko'chasi (In the Hast Imam district. From Metro station Gafur Gulom, go north 1.5km). Tomb of one of the first Imams of Tashkent. Visitors may wish to visit the mosque area of the city. The library there contains the remaining fragments of the world's first Koran, written only 19 years after the death of Hazrat Muhammad. 41.3370269.240294 Tellya Sheikh Mosque (Telyashayakh Mosque, Мечеть Тилла-Шейха), Zarqaynar Street (Зарқайнар кўчаси). Built in 1856-57. With a beautiful Islamic library with ancient ceilings and ancient manuscripts and the Osman Koran. It is considered the oldest Koran in the world and is said to have been stained with the blood of Hazrat Osman in 655. 41.33805669.2380565 Mausoleum of Abubakr Muhammad Kaffal Shashi (Kaffol Shoshiy Mausoleum, Мавзолей Абубекра Мухаммад Каффаль Шаши) (Next to Barrak-Khan Madrassa). It is the mausoleum of one of the first Imams who died c.976. The present mausoleum is rectangular in shape and is crowned by a conical dome. The frieze with inscriptions over the entrance and the panjara (wooden lattices) in the window openings are especially remarkable. 41.336969.23896 Barrak-Khan Madrassa (Baroqxun madrasasi, Медресе Барак-хана), Qorasaroy ko'chasi (E of Chorsu Market, in the old city). The madrassa was completed in the 2nd half of the 16th century. Barak Khan died in 1556 and is buried in Samarkand. Moyie Mubarek Library Museum, Zarqaynar 114, ☎ +998 26 00302. Daily 09:00-16:00. Preserving the world's oldest Quran from the 7th century. Namazgokh Mosque (Мечеть Намазгох). Built in 1850s. 41.33744369.2411437 Hazrati Imom Mosque (Мечеть Хазрати Имом). 41.32333369.2361118 Kukeldash Madrassa (Медресе Кукельдаш), Nawai Prospect (On a hill overlooking Chorsu Bazaar, next to the Friday mosque. - Metro station Chorsu). This Quran school was built in the 16th century during the reign of Abdulla-Khan by the vizier, scientist and poet, Kulbobo Kukeldash. Kukeldash means "the Khan's foster brother'. Kukeldash Madrassa is one of the largest and best-preserved Quran schools in Central Asia. The madrassa has a traditional composition with a large inner yard with hujras (pupils' cells) and darshakona and mosque in the corners. 2,000 som. 41.3230269.258949 Shayhantaur Complex (Комплекс Шайхантаур), Syr-Darya Oblast (At Tashkent Islamic University. From Metro stations Alisher Navoiy or Paxtakor, north ~1km till Ave. Abdulla Qodiriy, then turn right). Built in 14th century. 41.323269.258910 Kaldyrgach-bly Mausoleum (Мавзолей Калдыргач-Бея), Abdulla Qodiriy ko'chasi. The most ancient monument in Tashkent. The pyramidal dome dates to the 15th century, and is said to recall the mazars in the Kazakh steppes. Contains the tomb of a famous Kazakh political, Tole-bly, who had the nickname Kaldyrgach ("swallow"). 41.322969.2588511 Khavendi Takhur Sheikh Mausoleum (Мавзолей Шейха Хавенди Тахура), Abdulla Qodiriy ko'chasi. The first mausoleum was built in the 14th century. The present buildings were erected on the old foundations in the 18th and 19th centuries. Constructed with light yellow bricks, and has no decoration in the interior. 41.323169.257312 Yunus Khan Mausoleum (Мавзолей Юнус-Хана), Abdulla Qodiriy ko'chasi. Yunus Khan (1415-1487) was a descendant of Gengiz Khan and grandfather of the Indian moghul Babur. The building was erected in the 15th century and restored several times. It has no decoration except 'panjara' on the main façade. 41.3108669.2923614 Evangelical Lutheran Church (Евангелическо-лютеранская церковь), 37 Street Sadyk Azimov (Right nort of the British Embassy). 41.3398169.2924316 Bodamzar or Mirzo-Yusuf Mosque, Bogyshamol kuchasy (Боғишамол кўчаси) 98 (East ten mins walk from Metro station Bodomzor). 41.32365369.23731117 Dzhuma Mosque (Khoja Akhrar Mosque, Friday Mosque, Джума мечеть Ходжа Ахрар Вали), Samarqand Darvoza ko'chasi (Metro station Paxtakor). The first building of Dzhuma Mosque was built in 1451 at the expense of Sheikh Uboydullo Khodja Ahror (1404-1490). 41.3310869.2418418 Eshonguzar Mosque, Zarqaynar ko'chasi (Зарқайнар кўчаси) (Metro station Gafur Gulom 400 m). 41.335469.275319 Minor, Kichik Xalqa Yo'li (From Metro station Bodomzor one km to southwest, east bank of Bozsu creek). 41.31361169.27888920 Amur Timur Museum (Temuriylar tarixi davlat muzeyi, Национальный Музей Истории Тимуридов), Amur Timur (ул. Амира Тимура) 1 (Metro station Amir Temur Xiyoboni and Metro station Yunus Rajabiy half km to east), ☎ +998 13 36228, +998 71 232-0212, fax: +998 71 232-0213, e-mail: temurid@temurid.uz. Tu-Su 10:00-17:00, closed M. Rather kitschy murals depicting Timur. 3,000 som. 41.30110369.259521 Museum of Applied Arts, Rakatboshi 15 (Southwest ten min walk of Metro station Kosmonavtlar), ☎ +998 712 2533943, +998 712 2564042. Daily 09:00-18:00. In a house built by a Russian diplomat in the 19th century. With carved and painted plaster and carved wood, this museum gives an overview of old architectural details from Bukhara and Samarkand, ceramics and textiles, gift shop. 1,200 som. 41.315769.271122 Art Gallery of Uzbekistan (Галерея изобразительного искусства), Buyuk Turon 2 (Metro station Mustaqilliq Maidoni 100 m away). Tu-Sa 11:00-17:00; closed Su-M. Exhibitions of contemporary Uzbek artists in a modern museum building. 600 som (2012). Treasury of Ancient Oriental Manuscripts (Фонд древних восточных рукописей). Part of the Abu Rayhan Beruni Institute of Oriental Studies. Contains Uzbek, Arabic, Persian, Tajik, Urdu, Pashtu, Azerbaijani, Turkish, Tatar, Turkmen, and Uyghur manuscripts. Listed by UNESCO as one of the richest manuscript repositories in the world. 41.302669.2778223 Fine Arts Museum of Usbekistan (The State Museum Of Arts, Davlat Sanat muzey,), Shakhrisabz St and Amir Temur St corner (From Metro station Ming Orik toward NE five min walk), ☎ +998 23 67436. M 10:00-14:00, W-Su 10:00-17:00, closed Tu. Decent collection of Russian and European art combined with regional specialties, such as Russian paintings depicting Uzbek people and their lifestyle, local antiquities, and decorations salvaged from ancient temples. Some parts of this museum may require an extra ticket Behind it is a park with a Monument of Poet Zulfiya (Памятник поэтессе Зульфие). 10,000 som; locals, 3,000 som (2012). 41.319469.259525 Navoy Literary Museum (Alisher Navoiy nomidagi Davlat Adabiyot muzeyi, Государственный музей литературы имени Алишера Навои), Navoi 69 (Metro station Alisher Navoiy and Metro station Paxtakor are both very close), ☎ +998 24 41268, fax: +998 71 242-0275, +998 71 244-0061, e-mail: anavoi@uzsci.net. M-F 10:00-17:00; Sa 10:00-13:00; closed Su. Memories of the poet Alisher Navoi, calligraphy from Persia, miniatures from the 15th and 16th centuries. 3,000 som. 41.302869.264226 International Caravanserai of culture Ikuo Hirayama (Международный Караван-Сарай культуры Икуо Хираямы), Yusufa Khos Khodzhiba str. (Metro station Kosmonavtlar). 41.3230669.252927 Museum of telecommunication of Uzbekistan, 5 Abay ko'chasi. 41.305469.243828 Navruz Art Palace (Дворец "Навруз”), Furkata str., 5 (Right north of Alisher Navoiy Park. - Ten mins walk from Metro station Bunyodkor or Metro station Milliy Bog), ☎ +998 71 245-77-37, +998 71 2457748. 41.2953169.2905230 Railway Museum, Central Cultural Palace of Railwaymen (Museum of Rail Transport, Temir yol texnikasy muzeyi Дворец культуры железнодорожников, ДКЖ, Дом Культуры Железнодорожников, Ташкентский музей железнодорожной техники), 6 Turkiston ko'chasi (улица Туркистон) (Metro station Toshkent), ☎ +998 71 299 7277, +998 71 299-7040, +998 71 259-6708. Daily 09:00-13:00, 14:00-18:00, Sanitary days: Monday, Tuesday (not working excursion train and car museum). 41.3466569.2878732 [dead link] Museum of Victims of Repressions (Музей репресированным в Сталинские времена), Yunusabad District, Amir Timur St. (площади Памяти и почести, Шахидлар майдони), (Close to TV tower), ☎ +998 71 244-2940, +998 71 241-8556, fax: +998 71 244-2940, +998 71 241-8556, e-mail: museum_repression@mail.ru. Memories of the Stalin era. Located in the Memorial Complex Shakhidlar hotirasi. 5000 som. 41.306769.286533 Academy of Sciences of the Republic of Uzbekistan (Академия наук Узбекистана), Yahyo Gulyamov ko'chasi (From Metro station Amir Temur Xiyoboni half km SW), ☎ +998 71 233 68 47. 41.308669.278635 Tashkent City Hall (Tashkent City Khokymiyat), 11, Amir Temur St (Амир Темур шоҳ кўчаси). (South of Amir Timur Monument), ☎ +998 71 233-90-69, +998 71 233-79-80, fax: +998 71 233-65-88. 41.3151369.26717736 Mustakillik Square (Mustаqillik mаydоni, Independence Square, Площадь Независимости, Мустакиллик майдони), Mustakillik Square (Metro Mustakillik maydoni). The political centre of the Republic of Uzbekistan. Governmental buildings and the senate are here. Brothers Tombs. A popular tourist attraction and on 9 May (Victory Day) thousands of people visit the place to pay homage to the victims of World War II. Statues of war heroes are on the south wall of the monument. A statue of famous Uzbek General Sobir Rokhim is also there. 41.318369.269538 World War II Memorial, Sharof Rashidov Ave, (city centre , Mustaqillik Maydoni). Eternal flame and park has the names of all the fallen victims of WWII. 41.323682169.272455439 Monument of Courage, Sharof Rashidov St (300m from Independence Square, near to German Embassy). Built to acknowledge the courage of the people at the time of the Tashkent earthquake on 26 April 1966. The whole city was reduced to rubble and then modern Tashkent was built. 41.345669.284740 [dead link] Tashkent TV Tower (Ташкентская телебашня), Amir Temur St, (Амир Темур шоҳ кўчаси) (Between Metro station Habib Abdullayev and Metro station Bodomzor). Viewing levels and restaurants with views of the city. The TV Tower, built in 1981, is the highest building in Central Asia. It is 375 m high. It is the 10th highest building in the world and the 2nd highest buildings in GIS and has a revolving restaurant 110 m above the ground. Make sure to bring your passport. Foreigners US$15. 41.3142969.2706241 Receptions Hall of the Foreigh Affairs Ministry (Prince Romanov Palace) (Metro station Mustaqilliq Maidoni). 41.309669.280743 New Clock Tower (Chime), Istikbol St (Metro station Amir Temur Xiyoboni five mins walk). 41.3096169.279844 Old Clock Tower (Chime), Amir Temur Ave (South of Monument Park). [dead link] Experimental nuclear reactor (Reactor Dosimbaev Abdulrahim) (near Institute of Nuclear Physics), ☎ +998 712893134, e-mail: dosimbaev@inp.uz. By special permission. A project of the Academy of Sciences Republic of Uzbekistan. 41.30827369.25989345 Oqsaroy Presidental Palace, Afrosiyob ko'chasi (Next to State Puppet Theatre). 41.319269.255646 Old TV Tower (Старая телевышка) (Metro station Alisher Navoiy and Metro station Paxtakor are right there). 41.36269.312647 Yunusobod Aktepa (Юнусабадский Актеп), Otaboy ota Tursunov Str. (From Metro station Habib Abdullayev about two and half km east). An archaeological site of 5-13th centuries. There are found some remains of an ancient settlement with the strength and extensive artisan quarters. The 'Fortress' was here more like a castle-manor. Maybe here was the summer residence of the rulers of Chacha. Excavated here a remains of a Zoroastrian cult altar. The complex was surrounded by a moat. 41.317469.27471 National library of Uzbekistan named after Alisher Navoi, Navoiy shoh ko'chasi (West half km from Metro station Abdulla Qodirii or Metro station Yunus Rajabiy, north 300 m from Metro station Mustaqilliq Maidoni), ☎ +998 71 232-8394, fax: +998 71 239-1658, e-mail: info@natlib.uz. 41.3081369.283322 National Library of Uzbekistan, 51 Xorazm ko'chasi (SE ne block from Amir Timur Monument), ☎ +998 71 2391658. 41.301769.240674 Alisher Navoiy Park (Exit Milly Bog Station on the Chilonzor line of the Metro). This large park is popular on the weekends where many weddings are held. A fairground and man-made lake are also well frequented by locals. 41.3111469.279745 Amir Timur Monument & Park (Монумент Амиру Темуру), Amir Timur Square (Площадь Амир Тимура) (In the centre). Amir Temur in armour sits on his horse, holding the reins with his left hand and greeting the people with his right hand. A bust of Karl Marx previously occupied the position during Soviet times. 41.3438969.315287 [dead link] Tashkent Botanical Garden (Ботанический сад, Botanika bog’i, Ботаника боғи), Боғишамол кўчаси (From Metro station Bodomzor (Бадамзар) toward east). The total area covers 66 hectares. The herbarium is a storehouse of unique collections. The Paleobotanical collection include some valued pieces of Middle Jurassic Period Tashkutan from Hissar county, and from Lower-Middle Albian stage, in the southwest part of the Kyzyl Kum region's Kulzhuktau mountains. 41.339669.28178 Japanese Garden (Behind the Intercontinental Hotel. Metro station Bodomzor five mins walk away). Popular during summers. Many couples go there for wedding photos. 41.312569.29819 Mirzo Ulugbek Recreation Park, 21 Hamidulla Oripov ko'chasi (from Metro station Hamid Olimjon 10 min walk to south). 41.339869.312210 Tashkent Zoo (From Metro station Bodomzor (Бадамзар) toward east. - South of the Botanical Garden). 41.3419969.2853111 Aqua Park (Amir Temur Rd, near TV tower. Metro station Bodomzor). The water park has several pools, one with a wave machine, water chutes, and high slides. Well worth a few hours in hot weather. Take your own towel and pool footwear (the paths can get very hot). There is a restaurant and bars inside. Adult, 7,000 som; child, 4,000 som for 3 hours. 41.340269.285312 Tashkentland (near Aqua park, not far from Tashkent TV Tower; Metro station Bodomzor is right there). An amusement park. It has few nice rides, nothing special if you have been in big park, but a nice place to spend a free afternoon with friends. It is also worth a visit to a simple park in Tashkent. Although they have fewer attractions and are less exciting, they give off a more authentic feeling. 7,000 som. 41.321569.231617 Jar Sportcomplex, Laylito'g'on ko'chasi (SW of Metro station Chorsu). 41.309369.271518 Alisher Navoi Opera and Ballet Theater (Ballet and opera, Государственный Академический Большой Театр оперы и балета имени Алишера Навои), Ataturk Kochasi (ул. Ататюрка), 28 (From Metro station Mustaqilliq (Мустакиллик, Космонавтов) Maidoni walk. One block south from Russian Drama Theatre), ☎ +998 71 2339081, +998 71 2333344, +998 71 2321948. Ticket counter at the main entrance open on performance days from 10:00-19:00. Performances, M-F 18:00, Sa Su, 17:00. The theatre was built in neoclassical style from the plans of Alexey Shchusev, the architect of Lenin's Mausoleum in Moscow. The theater has special significance for Japanese nationals because it was built by Japanese prisoners of war during World War II. A plate acknowledging their contributions is part of the building. US$3-8,. 41.3183469.2613820 Ilkhom Theatre (Театр Марка Вайля Ильхом), Pakhator ( ул. Пахтакорская) 5 (Sodlik Hotel), ☎ +998 71 2422241, +998 71 2440403. Ticket counter: 11:00-18:00. Performances: Tu-Sa 18:30. Progressive theatre. Performances in Russian, sometimes with English subtitles. 2,500-5,000 som. 41.310369.272521 [dead link] Russian Drama Theatre (Академический русский драматический театрУзбекистана), Buxoro ko'chasi (ул. Зарафшон) (From Metro station Mustaqilliq Maidoni (Мустакиллик) walk to SE five mins), ☎ +998 71 233-8165, +998 71 233-4210. 41.2833269.2071322 Musical Comedy Theatre (Ташкентский государственный театр музыкальной комедии (оперетты)), Chapanata ko'chasi (Чапаната ул. квартал «Ц») (NW of Metro station Mirzo Ulugbek (Мирзо-Улугбек)), ☎ +998 71 277-8592, +998 71 277-8529, +998 71 277-8354. 41.322669.245423 National Academic Drama Theatre of Uzbekistan (Национальный академический театр драмы Узбекистана), 34 Navoiy shoh ko'chasi (ул. Навои), (South half km from Metro station Gafur Gulom (Гафура Гуляма)), ☎ +998 71 244-1751, +998 71 244-3375. 41.3244369.242924 Tashkent Circus (Ozbak Davlaat Sirki, Узбекгосцирк), 1 Zarqaynar ko'chasi (East of Metro station Chorsu), ☎ +998 71 244 3509, e-mail: circusuz@mail.ru..
41.321269.269525 Turkiston Palace, Abdulla Qodiriy ko'chasi (East of The Park Turon). A concert hall. There is a nice fountain before its. 41.30769.260926 State Puppet Theatre (Республиканский театр кукол), Afrosiyob ko'chasi (пр. Космонавтов), 1 (West of Metro station Kosmonavtlar), ☎ +998 71 256-62-46, +998 71 256-73-98. 41.32469.254127 Theatre for Young Audience (Республиканский театр юного зрителя), Abdulla Qodiriy ko'chasi ( ул. А.Кадыри), 13, ☎ +998 71 2447597, +998 71 2447620. 41.3269.25628 [dead link] Youth Theatre (Молодежный театр Узбекистана), 55 Navoiy shoh ko'chasi (ул. Навои) (Metro station Alisher Navoiy and Metro station Paxtakor are right there), ☎ +998 71 244-1087, +998 71 244-0088, +998 71 244-1089. 41.3266169.2421229 Ulugh Beg Planetarium, Zarqaynar ko'chasi (East of Metro station Chorsu). [dead link] Art Caravan, 73, Buyuk Turon Str. (Metro station Mustaqilliq Maidoni), ☎ +998 71 235 5833, +998 71 235 6164, e-mail: caravanstore@gmail.com. Selling hand-made goods. Caravan Art Gallery, Abdullah Quahor 22 (Near Istiqlol Palace next to Alisher Navoi Monument), ☎ +998 23 2556296, +998 23 1527555, e-mail: caravan@bcccum.uz. High quality handicrafts. 41.3185369.295032 Granart Art gallery (Арт-Галерея "Granart” , Художественная галерея), 13a Khamid Alimdjan sq. (площадь Хамида Алимджана,), entrance 4, Capital Business Complex (Metro station Hamid Olimjon is right there), ☎ +998 71 1205560, fax: +998 71 1205562, e-mail: granartgallery@gmail.com. Tu-Su 11:00 -19:00. Exhibitions, sale of artworks, art studio, cultural and educational activities, art therapy, collectors club, developing interior design, framing shop. Hamar centre - Art gallery, 40, Sharaf Rashidov Str, ☎ +998 712 2565226, fax: +998 71 2523530. Sells souvenirs. Human House, Usmon Nosir 30/9 (Near the Grand Mir Hotel), ☎ +998 71-255-4411, e-mail: humanhouse@mail.ru. M-Sa 10:00-19:00. Features handmade crafts and clothing of all sorts, ranging from full outfits to purses to beautiful hand-painted tea sets and ceramics at very reasonable prices. It is non-profit and is meant to help provide income to the crafts persons, who are often from remote poor villages. 41.317969.24374 Renessans Culture gallery (Арт-Галерея "Ренессанс”), Furkata str. (Between Metro station Bunyodkor and Metro station Gafur Gulom), ☎ +998 71 2449263, +998 71 3930034, +998 71 3930028. Former Pioneer Palace. Important update: As of March 2018, it is illegal to exchange money outside of official currency exchange offices. Moreover, foreign credit cards are not accepted in shops or restaurants, with the exception of the (expensive, but western-standard) supermarket korzinka. In principle, it is allowed that foreigners pay their hotels using foreign credit cards (but not in foreign currency), however, most hotels don't have the necessary device. For more information see the Uzbekistan#Buy section. Agrobank, Head Office, Street Mukimi, 43, ☎ +998 71 120 88 38, +998 71 2770822, +998 71 1506765 (Helpline), fax: +998 71 150-53-95, e-mail: headoffice@agrobank.uz. 41.313769.28466 Mortgage Bank, Central Office (Ipoteka Bank), Independence Avenue (Prospekt Mustakillik, проспект Мустакиллик), 17 (Center. Metro station Amir Temur Xiyoboni and Metro station Yunus Rajabiy are right there), e-mail: info@ipotekabank.uz. A Joint-Stock Commercial Bank. Microcredit bank, Head office, 14, Lutfiy street, ☎ +998 71 273-2811, +998 71 150-56-47 (Helpline), fax: +998 71 273-0590. 41.3081469.279847 People's bank (Xalq Banki), 3, Amir Temur avenue (Амир Темур шоҳ кўчаси) Mirabad district, ☎ +998 371 1201700, fax: +998 71 120-1703, e-mail: info@xb.uz. Business hours: M-F 09:00-13:00, and 14:00-18:00. 41.335669.28358 NBU Republic of Uzbekistan (National Bank of Foreign Economic Activities of Uzbekistan), Amir Temur street, 101 (Metro: Bodomzor), ☎ +998 71 233-6070, +998 71 234-4771, +998 71 235-9060, fax: +998 71235-90-20, e-mail: info@central.nbu.com. Uzpromstroybank (Uzbek Industrial and Commercial Bank), Yunusabad district Shaxrisabzkaya str. (Юнусабадский район, ул. Шахрисабз), 3, e-mail: info@uzpsb.uz. M-F 09:00-13:00, 14:00-18:00..
41.3083769.274479 [dead link] Central Bank of the Republic of Uzbekistan (CBU, Ўзбекистон Республикаси Марказий банки), Uzbekistan avenue (Ўзбекистон шоҳ кўчаси), 6. (Next to State Academic Grand Theatre named after Alisher Navoi), ☎ +998 71 2126010, +998 71 2525739, +998 71 2126299, fax: +998 71 2333509, e-mail: info@cbu.uz. M-F 09.00-18.00. 41.326969.23610 Chorsu Bazaar (Eski Juva) (Heart of Old Town, next to Chorsu Sq.- Metro station Chorsu is right there). The biggest and the most exciting oriental market in Tashkent. Eski Juva Bazaar is the biggest and oldest bazaar in Central Asia, operating on the same spot for over 2,000 years. The stalls of the bazaar stand under seven huge domes covered with colored glazed tiles. In the biggest domed building you will find all kinds of spices and cooking herbs: saffron, brown tree bark, red and black pepper, thyme and cloves, nutmeg, cardamom, as well as raisins, and dried apricots, almonds and pistachios, walnuts and peanuts. The bazaar is famous for peanuts boiled in sugar or honey, covered with sesame seeds. Under the small domes are the "workshops". Here craftsmen make and sell jewelry, painted cradles (beshik), gold embroidery, Uzbek chests with metal decorations, embroidered suzanes (thin tapestries), jiyak (lace for trimming the lower edges of women's trousers), quilted men's (chapan) and women's (yashmak) caftans, kurpacha quilts, pichok knives in leather or brass sheaths, and national musical instruments. Potters offer lyagan dishes and kosa bowls with blue and turquoise painted patterns. You will also find carpets from Khiva, Samarkand, Bukhara, Afghanistan and Turkey. 41.3197169.2807511 Central Market (Oloy Bozori, known to most locals as the Alayskee Bazaar), Amir Timur St (Metro station Abdulla Qodirii five mins walk, near to Dedeman Hotel). Beautifully laid out displays of local produce, dried fruit, and nuts. Every Friday and Saturday there is a wholesale dried fruit bazaar. The least noisy and crowded bazaar in Tashkent. Only here can you buy button and oyster mushrooms, Caspian sturgeon, and Far Eastern salmon. 41.2446669.1691212 Hippodrome Bazaar, Chilanzar District (2 km SW of Metro station Olmazar, take a tram from there). Tu-Su. Best for (leather) clothing, shoes. Very crowded. Yangiobod Bazaar (Green bus 26 runs there from outside Toshkent metro for 1,200 som. Bus 30 also runs there from "Toshkent mum". Each every 20-30 minutes or so. Taxis will take you there for around 8,000 som from the centre). 7:00-19:00 Tues-Sun. Huge flea market with an interesting history. Anything and everything a chap can unload. Second-hand clothes, unlike most of the other markets in Tashkent. Many markets are tagged as selling "everything", but rarely will you see live chickens opposite a heap of wheelchairs and (likely stolen) front doors. Watch your valuables especially closely. Smaller in the rain but definitely still open. Good for all your Soviet memorabilia needs. 41.3642669.2900613 Yunusabad Food Market (Юнусабадский продуктовый рынок), Ahmad Donish ko'chasi (From Metro station Habib Abdullayev north 1 km). Saligokh St, known locally as "Broadway", has some street artists, etc. The street is easy to find from the Amir Temur Monument, just head away from the Uzbekistan Hotel. The 'mirstore' just off of Saligokh St has a modern supermarket, coffee bar and hugely overpriced fashion stores. This area, known locally as "Demir," also has Mir Burger, which has burgers, pizza and local dishes at reasonable prices. There is also a Georgian restaurant ("Tbilisi") and a Chinese restaurant. There is a heavy police (militsiya) presence here and foreigners are not often, but occasionally asked for their documents. It is advisable to keep a photocopy of your passport and visa with you, but leave the originals in the hotel safe. Modern designer fashion and shops selling luxury goods from famous international brands have appeared in Tashkent. Catering for the wealthy, these can be found in the Broadway area, on Amir Temur Street and Pushkin Street. 41.308469.269314 Central Department Store (Tashkent Department Store (Former TSUM)), 17, Uzbekistan Ave. (O'zbekiston shoh ko'chasi) (Between Metro station Mustaqilliq Maidoni and Metro station Kosmonavtlar), ☎ +998 712 256 3001, +998 71 233 6288. A good place to find souvenirs. 41.321269.236815 Tashkent Shopping Center (Turkuaz Chorsu), Navoiy shoh ko'chasi (Metro station Chorsu). 41.336169.282516 Trade Center Tashkent Plaza, 107, Amir Temur Str (Next to International Business Center), ☎ +998 71 2389408, e-mail: tashkentplaza@ibc.uz. 41.317769.272317 Shopping center Poytakht (Торговый центр Пойтахт), Buyuk Turon Str. (Mustakillik Metro Station). [dead link] Rakhimov Ceramics Studio, Kukchka Dabaza 15, ☎ +998 14 90435. By appointment. In regular restaurants with (seemingly) western appearance, western prices are applied, e.g. a simple meal can easily be US$10-15 and drinks $3 and more. Bravissimo (Junction of Shahrisabz & Movarounnakhr St). Serves cakes and good local food. Russian language only. Bukhara Food (corner of Shahristan St, near Museum of Repression). Offer cheap, good quality food. Try the Following dishes: lavash (Armenian), shurpa (Uzbek), kazi kabob (Uzbek). Cafe Bukhara (near the railway station (Avliyoota St and little ring road intersection)). Cheap and tasty local food. Nice atmosphere and you can buy your drinks in a shop next to the place. 7,000-20,000 som for a meal. 41.3473769.285411 Central Asian Plov Center, 1 Guards Colonel Khodjaev St (1 ул. Ифтихор) (near TV tower and Museum of Victims of Repression). Plov is available for lunch, together with fresh tomato and other salads. All the plov is prepared outside in huge cauldrons. Go early as the place gets packed and sometimes they run out. 41.2921469.271732 Dilkash, Mirobod Ko'chasy. Specialty is shashlik from 7,000 som, fresh salads, and non. Plov and soup also available. No liquor is sold on premises, but nearby shops sell vodka and beer. Surxondaryo Zig'ir Oshi (On Lufti Street, just around the corner from Farkhad Bazaar). Typical Uzbek corner cafe, sells excellent plov cheaper than most places and, unusually, to late in the evening. 10,000 som for plov, 4,000 som for salad, 2,000 som for non and 1,000 som for tea. 41.30082869.2668813 Amfora Greek Restaurant (АМфОРА), Yakkasaray District (near junction of Shahrisabz and Movarounnakhr). Ariston, Sabir Rahimov, St Lashkarbegi, 2 (off Pushkin St). Like Polyanka, excellent food and cabaret entertainment (suitable for families). Ariston Park. One of a few good places to eat in Boghi Eram Recreation Park. Caravan, A Khalkat kochasi 22a. Breakfast USD10, lunch USD15, dinner USD20. Al Delfin. Excellent Arabic food. Great sheesha can be found here. Jumanji, 62/2 Yunus Khos Khodjib St and K. Jalilov St intersection, ☎ +998 71 2554200. 12:00-23:00. One of the best restaurants in town. Serves big portions of high quality Chinese, central Asian, and European food. Lunch USD15, dinner USD20. Khan Kuk Kwan. Korean food. Mir Burger (on Tashkent Broadway). So-called Turkish McDonald's. Nam Dae Mun, 24 Bukhara St (near Alisher Navoi Theatre and Broadway), ☎ +998 71 2320105. Fine Korean and Japanese restaurant. Reasonably priced. Pizzeria Bella Napoli, 63, U. Nasir St (next to Bon! coffee shop), ☎ +998 2539183, +998 2539184. 11:00-23:00. Small pizzeria, great atmosphere, and reasonably priced too (suitable for families). You might need to reserve a table on weekends as the place gets packed some evenings. Free delivery. Polyanka Cafe (Near Boghi Eram Recreation Park). Excellent food and cabaret entertainment (suitable for families). 41.29506869.2715674 Ristorante Semo de Roma, 40, Chekhov St, ☎ +998 71 1501835, +998 71 1501836, e-mail: semoderoma@abnmb.uz. 10:30-23:00. One of the best Italian restaurants in town. Excellent food and a very nice terrace. Lunch USD10, Dinner USD15. La Riva (next to Salvador Dali nightclub). Fast food plus huge variety of different international dishes from Russia, Korea, Italy, Tatarstan. Many college students drop in throughout the day and the evening. Salvador Dalí restaurant (Salvador Dalí tamaddixonasi). 41.31047869.2738195 Sultan Fast food, Mustafo Kamol Otaturk ko'chasi. Tang Cheng Chinese Restaurant, 60A Amir Temur St, ☎ +998 71 1358916. Good Chinese restaurant. Club Diplomat (S Navoy St 200 m from Dedeman Hotel). Billiard tables. It can be very busy and getting in may be difficult if your face does not fit. 3,000 som (free for ladies). 41.302369.28891 Patrick Irish Pub, 45a Istikbol St (Istiqbol ko'chasi) (About one km South from Metro station Amir Temur Xiyoboni). 41.3110269.287522 Chalet, ☎ +998 71 2338639, e-mail: 2d_murad2002@mail.ru. Great bar in the centre of the city. Beer from 7,000 som. When you check out you will be given a tiny registration card that the next hotel will ask for. 41.3280369.229951 Gulnara's B&B (Гостевой дом "Гульнара"), Ozhod Street (Short walk from Chorsu Bazaar Metro Station), ☎ +998 93 402816, e-mail: gulnara@globalnet.uz. Clean, and comfortable. Rides from the airport can be arranged for a reasonable price. The owner can be very rude and unfriendly sometimes. Single US$20, double $40, dorm $15 (2014). 41.2818169.281872 Glen Eden Hotel (Гостиница Глен-Эден), Chavandoz (ул. Чавандоз), 16-18 (near Clinical Psychiatric Hospital; from Metro station Toshkent to south one km), ☎ +998 97 704 4559. A two-star hotel. Rooms with bath or shower, air conditioning, direct dial international telephone, internet access, satellite TV, mini-bar, hairdryer. In the hotel: lobby, reception. security service, restaurant, children's play room. Laundry service. Economical single US$$35, double $60; standard suite single US$50, double $75; business suite single US$75, double $95..
41.281669.26283 Grand Tashkent Hotel (Гранд Ташкент), 57, A. Kahhara-6 (Abdulla Kaxxar 6-tor ko'chasi) (second house from the Embassy of Tajikistan), ☎ +998 71 2550599, +998 97 4052677 (mobile), fax: +998 71 2550599, e-mail: hotel_grand_tashkent@yahoo.com. A two star hotel Standard single US$50, double $60, triple $70; luxury: single $65, double $75. 41.3349869.221444 Jahongir Hotel (Частный гостевой дом Джахонгир), Chirokchi 4 (from Metro station Tinchlik north 10 min walk), ☎ +998 66 2357899, +998 91 5550808 (mobile), fax: +998 66 235 7899, e-mail: jahongir.hotel@gmail.com. A two-star hotel with excellent staff. In the suburbs but near a metro station. Economy rooms are with shared bath. Single US$35, double $45; economical single US$28, double $35. 41.334969.23375 Mirzo guesthouse, 95 Sagban St (short walk north from Chorsu Metro), ☎ +998 93 3796668 (English), +998 71 2443794 (Russian), e-mail: turkturizm@mail.ru. Traditional house. Clean. Friendly owner. He often plays traditional music for the guests. Wi-Fi in the evening only. Dorm US$15; double U$35-40. 41.2919569.263956 Orzu Hotel (Гостиница Орзу), Ivliev Str (уллица Ивлева), 14 (near Raduss Hotel; from Metro station Oybek and Metro station Ming Orik toward southwest), ☎ +998711208822, fax: +998711208824. Check-in: 14:00, check-out: 12:00. A 2-star hotel. 34 rooms, sixteen singles, sixteen doubles Single US$45, double $65, triple $80 (2013). Asia Tashkent Hotel (Азия Ташкент) (Usman Nosir St? ), ☎ +998 71 2509687, +998 71 2509688. It has an indoor swimming pool, sauna, Turkish bath, 72 rooms, nightclub, and is popular among European customers. Single from US$50. 41.3417869.279588 Expo Tashkent Hotel (next to the Expo Centre; take a metro to Bodomzor 500 m northwest from there). 41.2930469.271869 [dead link] Grand Ist Hotel, Yakasarayskiy d-ct., Bolshaya Mirabadskaya Street 1/28 (north of Mirabad Bazaar; Metro station Oybek 15 min by walk to north), ☎ +998 71 255 5246, +998 90 998-9868 (Mob), fax: +998 71 254-7900, e-mail: www@grandist.uz. Standard single US$65, double or twin $85, triple $100, luxury double/twin $130. 41.284269.257410 Grand Orzu Hotel (Отель Гранд Орзу), 2 Kunaev Street/27 Makhmud Tarabi Ko'chasi (south of Babur Park; Metro station Oybek 2 km away). A three star hotel 50 guestrooms, including twenty one single rooms with king size beds, ten luxe rooms and 19 double rooms with two standard beds. Single US$45, double $60; deluxe single $65, double $75, triple $90. Grand Raddus Hotel (Гранд Раддус JSS), 11, 2 Passage Kichik Mirobod Street. A three-star hotel King size bed or twin single/double US$55/80, VIP double $130. 41.2908569.2007111 Malika Hotel (Малика), 53A Chapanata ko'chasi (Metro station Mirzo Ulugbek), ☎ +998 71 1730203. Check-in: 14:00, check-out: 12:00. Probably the best bang-for-the-buck in Tashkent. Well-equipped and nicely outfitted. Ownership includes an American partner. Services: restaurant, business center, bar, laundry and ironing, parking, conference hall, sauna with Jacuzzi. Internet is non-existent in rooms, and marginally so in their lobby (email, etc., but no Skype). Also in Samarkand, Bukhara and Khiva. Single/double US$40 / 60 / 70 including breakfast. Oasis Asaka Hotel (Оазис Асака), Khamza District. A four-star hotel Single standard US$45, superior $55, double $75, triple $95; deluxe single $90, double $100. 41.2894369.2687112 Rovshan Hotel (Ровшан), 118 Katta Mirabad Str. (ул. Мирабадская), 118 (Near the Turkmen Embassy), ☎ +998-71 120 7747, fax: +998-71 120 7747. Good service and cold beer sold at reception for 2,000 som a bottle. Standard room single US$55, double $70, triple $80, deluxe for one/two $70/80 (2014). 41.2969.265313 Raddus Hotel (Раддус JSS), 39/41 Suleymanova st, Yakkasaray District, (SW 2 km from Metro station Oybek). A three-star hotel 55$+. Retro Palace Hotel, 65 Vahidov St. 55$+. Sayokhat Hotel (Гостиница Саёхат). A 3-star hotel. Prices include breakfast only. Free Wi-Fi. Lunch buffet $15, dinner buffet $15. Services: business center, room service 24 hours a day, order railway and airline tickets, taxi, Internet, currency exchange, laundry, sauna, massage, pool, parking. Single shower US$50-75, double $90-100, triple $100, quadruple $110, suite $120. 41.318569.261414 Shodlik Palace Hotel, Pakhtakor Street (Пахтакор кўчаси), 5 (Metro station Paxtakor and Metro station Alisher Navoiy are both west of it). A four star hotel From US$60. 41.319769.285315 Elite Hotel, Street 75, 10, Tashkent 700063, ☎ +998 71 1208829. 41.2704169.3291316 Gelikon Vest Hotel, Jarqo'rg`on ko`chasi Street 76 A (east of the airport; from Metro station Toshkent take a tram toward south after Risovyy bazar stop at Jarqo'rg`on ko`chasi Street (there is a petrol station) turn to east about 200 m on the right side is the hotel), ☎ +998 94 3637878. 41.318969.247717 Sambuh Elite Hotel, 10, Tsekhovaya Street, Tupik-1 (west of Metro station Paxtakor and Metro station Alisher Navoiy), ☎ +998 71 1208826, +998 71 120 88 21, e-mail: sambuh.hotel@gmail.com. 38 rooms Single US$55, double $80, triple $100; deluxe single $80, double $100. 41.311569.282618 [dead link] Uzbekistan Hotel (Отель Узбекистан,Otel O'zbekiston), 45 Hamza Street (Taraqqiyot ko'chasi) (Metro station Amir Temur Xiyoboni and Metro station Yunus Rajabiy are very close), ☎ +998 71 1131111, +998 71 13-1012, +998 71 236-7666, fax: +998 71 113-1122, +998 71 113-1090 , +998 71 113-1100, e-mail: reservation@hoteluzbekistan.uz. Offers 285 rooms. Services: dry cleaning, laundry, room service 24 hours, deposit safe, wake up call, ticketing office, porterage, luggage room, barbers shop, exchange ofice, credit card payment, florists services, gift shop, free WiFi internet in the hotel, car rental, organization of sightseeing tours, sauna, massage, gym From US$65. 41.295569.254719 Hotel BEK (БЕК), 64A Yusuf Hos Hojib (ул. Юсуф Хожиб) (North of Babur Recreation Park), ☎ +998 71 215 5888, +998 71 215 5999, +998 71254 8118, +998 71 215 5454. US$100. 41.315869.279920 Hotel City Palace (Former Markaziy Hotel, Sheraton), Amir Temur St (Metro station Yunus Rajabiy a couple minutes walk). A former Sheraton hotel. It is one of Tashkent's taller buildings. The rooms are still very good, but service and maintenance. Bar/restaurant bills must be paid in cash. Classic single US$90, double $110; Studio single $160, double $180; Senior Suite single $320, double $340 (2014). 41.317769.280321 [formerly dead link] Dedeman Silk Road Hotel (Дедеман), Amir Temur St (Between Metro station Yunus Rajabiy and Metro station Abdulla Qodirii), ☎ +998 71 23401, fax: +998 71 234242. Excellent hotel in the city centre. Drinks are overpriced. Free Internet connection in rooms. USD160+. 41.303769.284322 Miran International Hotel (Отель "Miran International"), Borovskiy ko'chasi (Shakhrisabz Passage 4,). A five-star luxury hotel Deluxe single US$130, double $160; superior $400; premium suite $600. 41.296269.267723 Grand Mir Hotel (Гран Мир), 2 Kunaeva St (SW from Metro station Ming Orik, Metro station Oybek), ☎ +998 71 1402000, fax: +998 71 1402040, e-mail: info@grandmirhotel.com. A four-star luxury hotel for business travellers. Wi-Fi. Rates include fitness centre and a healthy breakfast. From US$130. 41.3108669.2856924 Le Grande Plaza Hotel (formerly BUMI, Гостиница Ли Гранд Плаза), 2 Uzbekiston Ovozi St (Metro station Amir Temur Xiyoboni and Metro station Yunus Rajabiy are very close). Executive floor with lounge, outdoor pool, South Indian restaurant. 10 km from airport. US$150-200. 41.295769.2561725 Hotel Ichan Qala, Yusuf Hos Hojib ko'chasi ( ул. Юсуф-Хос-Хожиб), 75/10 (close to State Pedagogical University and BEK hotel). A four-star hotel. 68 rooms: Superior, DeLuxe, Junior Suite, Suite, Presidential Suite and Villa Standard single US$125, double $150; deluxe room $180; en suite room $250, Junior Suite $290, Senior Suite $375, Executive Suite Room $415, Villa Khorezm $2500. 41.337869.283526 InterContinental Hotel, ул. А.Тимура, 107А (Amir Temur St next to Tashkent Funland, Japanese Garden), ☎ +998 71 1207000, fax: +998 71 1206459. US$181-2,200. 41.3248469.2634927 Ramada Tashkent (Former Hotel Park Turon, Парк Турон), 1 Abdulla Qodiriy ko'chasi (between Metro station Gafur Gulom and Metro station Abdulla Qodirii), ☎ +998 71 1406000, fax: +998 71 140 6030, e-mail: info@ramadatashkent.com. A four-star hotel. 130 deluxe rooms with tea/coffee maker, cable/satellite TV, minibar, in-room safe, work desk, iron & ironing board (on request), hair dryer, blackout drapers and design bathroom with shower and bathtub. Upon request, rollaway beds, baby cribs Superior rooms from $150, Premium Rooms $170, Privilege Rooms $185 (2015). 41.334769.285228 Radisson SAS (Радиссон SAS), 88 Amir Temur Street, (about 2 km from the city centre opposite Intercontinental, south of Metro station Bodomzor), ☎ +998 71 1204900. Four star hotel From US$200. 41.309569.268629 Tashkent Palace Hotel (Formerly Le Meridien), 56, Buyuk Turon St (Central Department Store is right there), ☎ +998 71 1205800. A four star, traditionally-styled and visually impressive hotel. Very poor Internet. from $155. 41.308169.2781 Beeline Mobil Office, 1 Buxoro ko'chasi. 41.295469.2762 East Telekom Office, Chehov ko'chasi (from Metro station Oybek SW 10 min walk). 41.31769.28413 Central Post Office (Pochtamti), 7 Shahrisabz ko'chasi (Metro station Abdulla Qodirii), ☎ +998 71 233 47 49. Tashkent is generally a very safe place to visit. However, visitors should refrain from political activities or doing anything that could be regarded as undermining the state. As anywhere, remember to watch your personal belongings. There have been incidents of robbery, including some violent assaults but they are very rare. Travellers should use the same caution they would use in any large city, especially at night. It is not advisable for foreigners to walk around alone at night, especially in areas where few people are about and/or lighting is poor. Police sometimes levy small on-the-spot fines for minor offences such as appearing to be slightly intoxicated. Stomaservice (Dental clinic), Buyuk Ipak Juli, ☎ +998 26 68899, +998 11 05588. Klinik/Hospital 1, Machlor Oim St 40, ☎ +998 26 48105, +998 26 40511, +998 26 48105. Klinik/Hospital 2, Aschgabadskaya St 3, ☎ +998 26 74265. Tashkent International Medical Clinic (TIMC), Sarikul St 38, ☎ +998 29 10142, +998 29 10726, 1858481 (domestic - emergencies), 1084457 (domestic). Medical and dental care. VIP Poliklinik, Sadik Asimov St 67, ☎ +998 13 62625, +998 13 94260. Afghanistan, 6, Murtazaev St, ☎ +998 13 48432, +998 13 48458, fax: +998 13 42634, e-mail: afgemuz@online.ru. Australia, ☎ +7 495 956 6070. Australian Embassy in Moscow is accredited to Uzbekistan. Azerbaijan, 25, Shark Tongi St (ул. Шарк Тонги) (Oliy Madjlis Bldg), ☎ +998 17 36167, +998 17 33717, +998 13 48458, fax: +998 71 273 2658, e-mail: tashkent@mission.mfa.gov.az. Bangladesh, Vahidov St., 33, ☎ +998 71 1206711, +998 71 2540421, fax: +998 71 1206711, e-mail: mission.tashkent@mofa.gov.bd. 41.307469.28864 Belarus, 53, Vokhidov St/ Gulyamov St, ☎ +998 12 07252, +998 12 05233, +998 15 27258, fax: +998 12 07253, e-mail: Uzbekistan@belembassy.org. Bulgaria, 52, Rakatboshi St, ☎ +998 56 4888, fax: +998 15 23952, e-mail: posolbg@bbc.com.uz. Canada, 56, Usman Nosir St, Apt 39-40, ☎ +998 71 2539205, fax: +998 71 253-92-05, e-mail: hc.canada.uz@gmail.com. A small honorary consulate to aid citizens. Most affairs handled through the Canadian Embassy in Moscow. For emergency after-hour service, call the Moscow Embassy +7 (495) 925-6000. 41.306769.28795 [dead link] China, 79, Gulyamov St (next to Belarusan Embassy), ☎ +998 13 38088, +998 13 60851, fax: +998 13 34735. Czech Republic, 9, Hidirali Ergashev St, ☎ +998 12 07733, fax: +998 71 1206075. Egypt, 53, Chilanzar St, ☎ +998 12 05008, +998 12 05009, fax: +998 12 06452. 41.3061969.286026 France, 25 Qo’qon Yuli Rd (next to Academy of Sciences of the Republic of Uzbekistan), ☎ +998 71 2335382. 09:00-12:00, 15:00-17:00. Georgia, 16, Tarobiy St, ☎ +998 16 26243, +998 16 29139, fax: +998 54 6535, e-mail: gruzemb@geo-embassy.co.uz. 41.3255669.27237 Germany, 15, Sharaf Rashidov Ko'chasi (Courage Monument, near to River Anhor, 1 km northwest of Metro station Abdulla Qodirii), ☎ +998 12 08440, +998 12 08472, +998 18 15406 ( emergencies German), +998 18 15407 (Russian and Uzbek), fax: +998 12 08450, +998 12 08485, +998 12 08480 (visas). M-Th 08:00-12:00, 13:00-17:00; F 08:00-11:00. 41.325269.31018 India, 15/16, Kara-Bulak Street ( Korabulok Ko'chasi) (North of Metro station Pushkin), ☎ +998 12 04996, +998 12 04997, fax: +998 13 61976, e-mail: amb.tashkent@mea.gov.in. [dead link] Iran, 20, Parkentskaya St, ☎ +998 71 686968, fax: +998 71 12 06761, +998 71 687818. 41.286169.257310 Israel, 3, Abdulla Kahar St (улица А.Каххара) (East to Babur Park), ☎ +998 12 05808, +998 12 05807, fax: +998 71 407555. M-F 09:00-13:00. Italy, 40, Yusuf Hos Hojib St, ☎ +998 15 21119, +998 15 21120, fax: +998 71 1206606, e-mail: segreteria.tashkent@esteri.it. 41.305769.291911 Japan, 1/28, Sadyk Azimov St (one block east to Chinese Embassy), ☎ +998 12 08060, +998 12 08061, fax: +998 12 08077, e-mail: jpembuz@embjapan.intal.uz. 41.2968669.2782412 Kazakhstan, 23, Chehov St (ул. ЧЕХОВА) (southeast of Metro station Oybek), ☎ +998 15 21654, +998 13 60986. M-F 09:00-12:00. USD30. Kyrgyzstan, 30, Samatov St, ☎ +998 13 74794. Netherlands, 77, Usmon Nasirov St, ☎ +998 12 06141, fax: +998 12 06367. New Zealand, ☎ +7 495 956 3579. NZ Embassy in Moscow handles affairs with Uzbekistan. 41.2853269.2703613 Russian Federation, 83, Nukus St (Mirabad Market. - Metro station Toshkent 1 km northwest), ☎ +998 15 26280, +998 12 03519, fax: +998 15 22143, +998 12 03504, e-mail: rusemb@albatros.uz. South Africa, 30A, Asaka St, ☎ +998 13 70170, +998 13 71824, fax: +998 13 72546. 41.301369.271514 South Korea (from Metro station Ming Orik to north 3 min walk). Spain Consulate, 25, Kichik Besh-Yogoch St, ☎ +998 15 25027. Switzerland, Blind alley 1, 4, Nosir St, ☎ +998 12 06738, +998 12 06739, fax: +998 12 06259. 41.281269.26215 Tajikistan, 61, Abdulla Kahor St (from Babur Recreation Park 1 km south), ☎ +998 54 9966, fax: +998 54 8969. 41.305969.28716 Turkey, 87, Gulyamov St (Republican Office of Public Prosecutor) (next to Chinese Embassy. Center), ☎ +998 13 38037, +998 13 72104, +998 13 32107, fax: +998 12 06536, +998 13 31358. 41.3072169.2871717 Ukraine, 68, Yahyo Gulyamov St (next to Academy of Sciences of the Republic of Uzbekistan), ☎ +998 13 6012, +998 13 35523, fax: +998 13 31089. 41.3091669.2927218 United Kingdom, 67, Gulyamov Street (Yahyo Gulyamov ko'chasi) (Center: from Metro station Amir Temur Xiyoboni walk to east on O'zbekiston Ovozi ko'chasi and at second crossing turn right), ☎ +998 71 1207852, e-mail: ukin.uzbekistan@fco.gov.uk. M-F 09:00-17:00. 41.3672969.2715119 United States, 3 Moyqorghon St, 5th Block, Yunusobod District (far north: first to Metro station Habib Abdullayev further 2 km north), ☎ +998 71 120 5450, fax: +998 71 1206335, e-mail: TashkentInfo@state.gov. M-F 09:00-18:00. For after-hours emergencies, American citizens should call +998 71 120 5450. Embassy includes an Information Resource Center with a small library, English-language magazines, free Internet access, and access to several large electronic databases of information. Staff can also help Uzbeks wanting to practice speaking English and answer questions about the US and US-Uzbek relations. Shymkent -Five coaches a day run between Tashkent and Shymkent, leaving from Tashkent Avtovokzal (the central one) at (ostensibly, but don't count on the times) 07:00, 09:00, 12:00, 15:00 and 18:00. Tickets are about 40,000 som but this can be brought down by bargaining. The route began in late 2018. The process is smoother and more official than the shared taxis, with faster border crossings and tickets to be bought from a "kassa" in the station. Comfortable ride, takes about 3-4 hours. 41.6470.0350 Lake Charvak (Chor bogh) (NE 100 km). The reservoir was created by erecting Charvak Hydropower Station on the Chirchiq River, a short distance downstream from the confluence of Pskem and Chatkal rivers in the western Tian-Shan mountains. The reservoir popular resort place for locals. 41.92948570.48808330 Ugam Chatkal National Park (Chatkalskiy State Nature Reserve, Угам-Чаткальский Национальный Парк), Toshkent Province. Bustonlik tumani (NE about 140 km take R-5 road). About 570 km² of mountain steppes, mountain forests, alpine meadows, river valleys and floodplain forests. This city travel guide to Tashkent is a usable article. It has information on how to get there and on restaurants and hotels. An adventurous person could use this article, but please feel free to improve it by editing the page. This travel guide page was last edited at 03:11, on 24 April 2019 by Wikivoyage user PresumingEb. Based on work by Wikivoyage users Ground Zero, ARR8, Shlui, Traveler100bot, Balkanique, Mx. Granger and Wrh2Bot, Wikivoyage anonymous users 91.65.170.16 and 218.212.183.18 and others.